The New Hardy Players were delighted to collaborate with Dorchester Ballet Club on this production of The Trumpet Major. The four Harlequin dance interludes in the play were devised by Lucy Bishop with Alastair Simpson and Penny Levick, and performed superbly by Rhiannon Bennett, Gloriana Davies, Daisy Essex, Clover Kellet, Isabel Harrold and Amelia Smeaton. High Tea with Mr Hardy. Guests to include Sir James Barrie and some of our younger NHP members in excerpts of Peter Pan. These are times of change…The New Hardy Players bring Under The Greenwood Tree to the stage at the Corn Exchange, where Thomas Hardy saw the original Hardy Players perform the first dramatization of this most light-hearted and humorous of the Wessex novels in 1910. The 2016 adaptation had been written by renowned actor, playwright and director Jack Shepherd (Inspector Wycliffe) and cleverly tackles the social changes which rock the small community of Mellstock. “There can be few better ways of welcoming the festive season than watching the New Hardy Players perform Thomas Hardy’s warm hearted story of Dorset country people of yesteryear which feature their traditional Christmas celebrations” Marian Cox at the dorset Echo. Step back in time 90 years for a unique evening of live theatre at Max Gate. We enjoy the company of Mr and Mrs Thomas Hardy, plus their illustrious literary guest, and a few of the colorful characters from Hardy’s novels. While Mrs Hardy entertains in the dining room, the domestic staff gossip and grumble in the kitchen. Thomas struggles with a particularly awkward stanza in his study, and The Hardy Players enact a dramatic scene in the bedroom, complete with costumes, music and dancing. A new treatment of the story written by Howard and Alison Payton and directed by Howard Payton for the 10th anniversary of Norrie Woodhall’s 100th birthday request that the New Hardy Players be reformed to perform a play to celebrate her centenary. This work by Thomas Hardy was written in 1916, halfway through the First World War, to raise funds for the Red Cross. It was culled by Hardy from his longer dramatic work, “The Dynasts”. Our performance was the first since those in 1916, and we are grateful to the Dorset County Museum for supplying us with the original playscript. Front: Connor Dooley (Giles Winterbourne). Centre, left to right: Sophie Cridland (Grace Melbury); Robert Cole (Dr Fitzpiers); Emma Hill (Mrs Charmond). Back: Chris Pullen (Mr Melbury). Photo: Howard Payton. Written by John O’Keefe in 1798 while on holiday in Lulworth, this very amusing Georgian comedy surprised and and delighted an enthusiastic audience. The play was performed as a dramatised reading by the New Hardy Players and guests in the Victorian Gallery at Dorset County Museum. The reading was inspired by the Georgian Faces exhibition and directed by Tim Laycock.The play was seen again in the place that inspired it and much of it written – West Lulworth. Tim Laycock directed the acted and costumed reading as part of the Cultural Olympiad in May 2012. £517 was raised for the Joseph Weld Hospice. Devina Symes adapted Hardy’s 1924 script for a contemporary audience, adding some scenes not included in the original 1924 play script. Hardy added an extra line for Liza Lu, played by a young Norrie Woodhall, because Norrie had so little to say. For the same reason, Devina added an extra, extra line for our Liza Lu (Charlotte Fairman). How many spotted this is unknown. The final scene of our play was staged as Norrie Woodhall described it from her own appearance in Hardy’s original adaptation, also directed by him: Tess, accompanied by Angel Clare, is arrested by a phalanx of constables for the murder of her other suitor Alec d’Urberville at sunrise, following a night spent within the bluestone towers of a lonely henge on the bleak and wind swept expanse of Salisbury Plain. Known to us as Stonehenge. 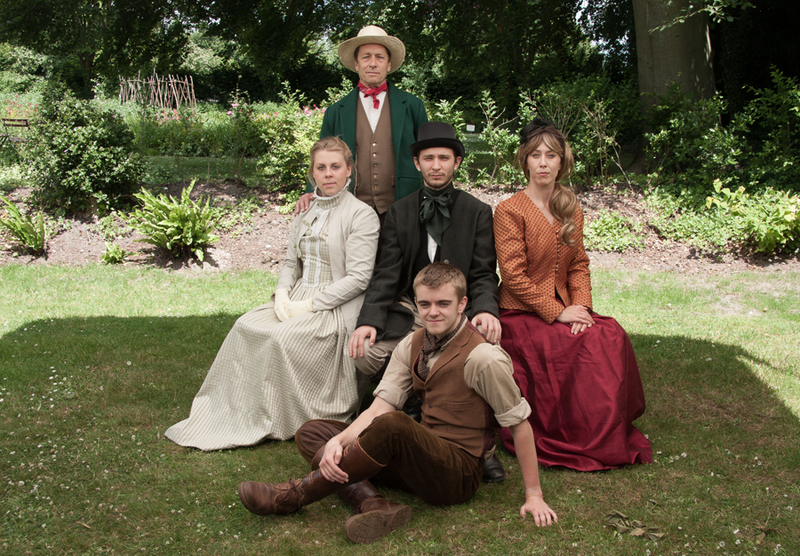 Our summer 2010 production was Thomas Hardy’s “The Distracted Preacher”. Director Tim Laycock added a musical twist to this Hardy romantic comedy, first adapted by the very talented Ray Sargent. This Hardy tale of romance and smuggling proved to even the most hardened sceptic that Hardy really did have a fine sense of humour. A Life of Three Strands was co-written by Devina Symes and Norrie Woodhall and drew on Norrie’s direct knowledge of Hardy. It was performed in various venues around Dorset. Hardy himself had referred to the three great interests in his life as ‘the three strands’ – they were architecture, the study of the classics and his love of the countryside. In the autumn of 2004 Olive Blackburn and Devina Symes asked Norrie Woodhall what she would like for her 100th birthday the following year. 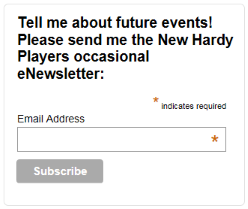 Without hesitation, she asked that the Hardy Players be reformed to perform a play to celebrate her centenary. By chance soon afterwards, Harry Tilley’s 1920 adaptation of The Return of the Native came to light, which Tim Laycock re-worked for a contemporary audience. The play, which showed at four venues throughout Dorset, including the home of Julian and Emma Fellowes – the patrons of the New Hardy Players – raised nearly £3000 for Norrie’s chosen charity: Weldmar Hospicecare Trust.